Organic Aromas Aromatherapy discusses interesting topics related to the use of natural, pure essential oil. Tips, tricks, DIY, lessons, news and information about the topics people who enjoy essential oils wish to know about most. In addition, Organic Aromas showcases its powerful, beautiful Nebulizing Diffuser®. This special device is the best instrument for professional aromatherapy. It can emit a strong, pure aroma across a wide area in a short period. It also has NO heat, NO water and NO plastic. This what your Organic Aromas Aromatherapy Blog Ad will look like to visitors! Of course you will want to use keywords and ad targeting to get the most out of your ad campaign! So purchase an ad space today before there all gone! 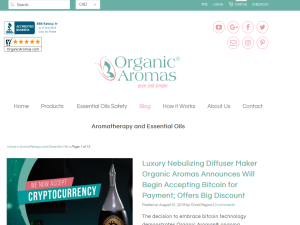 If you are the owner of Organic Aromas Aromatherapy, or someone who enjoys this blog why not upgrade it to a Featured Listing or Permanent Listing?